Anyone that knows me knows that I love hot dogs. I’ve made it a point to seek out iconic hot dogs at places such as Blackie’s in CT, Lafayette Coney Island in Detroit, various Chicago spots, Ted’s in Buffalo (and Arizona), as well as any number of additional places. 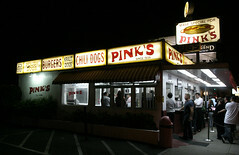 One noticeable omission in my reviews has been Pink’s in Los Angeles. I’ve been here before, but not in many years. But, with a late night flight arrival, I had an opportunity to visit on the way out to Edwards AFB. onions, chili and sauerkraut), to the Lord of the Rings (stretch dog with bbs sauce and onion rings), this place has all the bases covered. I’ll have to say, a lot of the combos don’t appeal to me (like ketchup, guacamole and sour cream have no place on a hot dog), but they are obviously trying to appeal to a wide crowd. What did work reasonably well for me was the basic chili dog. Mustard, onions, and a mild chili that reminded me of most of the “Coney Island” dogs I’ve had, with a slightly better hot dog underneath. My “Coleslaw dog” was pretty much your basic Carolina-style hot dog, and my “New York Hot Dog” was also sported as reasonably authentic hot onion sauce. None of these was earth-shatteringly good, but reasonably well executed, especially for a place that tries to be so many things to so many people. On the down side, the dogs are a bit pricey, and the line can be long. And, quite frankly (bad pun), I’m not as big a fan of all-beef dogs as many people, but these are good beef dogs. If you’re looking for a good basic dog? You can probably get better elsewhere for cheaper. But for a good chili dog, or one of the various specialty dogs, this is a rather good place. It sounds like the Rosie O’Donnell gives you gas.